Restaurant customs are different all over the world. For example, in Egypt, waiters tend to take your plates and drinks before you’ve finished. This always annoyed my ex-pat friends. I think they felt like we were being asked to leave. But you can stay at a table in Egypt as long as you like and you’ll rarely be bothered by the wait staff to order something else or free up the table. Here in Buenos Aires, wait staff always ask if they can take your plate. There may be nothing at all left, but still they ask “Puedo tirar los platos?” Then they’ll come back to see if you want dessert or coffee. To an American, when you decline dessert it’s obvious you’ve finished and the waiter will likely bring the check to the table. Here you have to ask for the check. It’s similar to Egypt, you’re welcome to linger at the table just as long as you like even if you don’t order another thing. These differences are sometimes frustrating to foreigners who might think, “geez, how come they haven’t brought the check yet?” But until you request it, “la cuenta, por favor,” you won’t see a check. Sometimes tracking them down for the check takes effort. They aren’t eyeing you like a hawk, waiting for those diners to get up so another tip can come in. 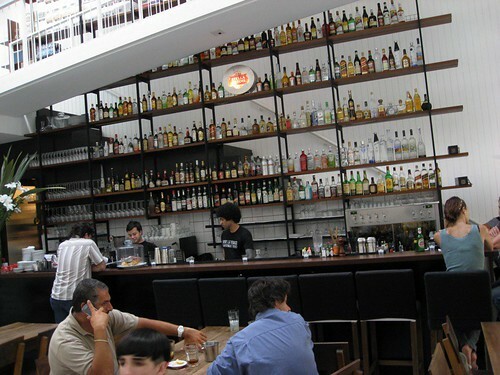 San Telmo Loft Weblog · Travel news and advice for Buenos Aires and Argentina.